Home>News>Meet Amanda Evans…Hygienist of the Year! Amanda Evans (Mandi as she prefers to be known) is a brilliant example of an ordinary person who encourages her team at mydentist Kandy Lodge, Wrexham, to do extraordinary things. Mandi works as an employed hygienist, but goes far above and beyond the call of duty in her care of patients and her contribution to the practice and wider community. She is only too happy to pass on her knowledge to others and plays a vital support role in the practice. 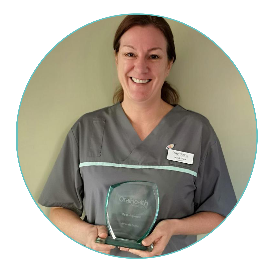 Mandi was recently was crowned ‘Hygienist of the Year’ at the Oral Health Awards and there is no doubts around why she was presented with this great accolade. mydentist Kandy Lodge is an Foundation Dentist training practice. When they start, it’s often clear that the FD’s have little clinical experience and are not confident in their knowledge of oral health products and hygiene advice. To improve their knowledge, it’s now part of their induction programme that they spend time nursing with Mandi. They learn how she advises patients on their hygiene, what cases require more than a standard scale and polish, effectively managing periodontal disease and oral health product recommendations. When it comes to patients, Mandi is tireless in providing clinical excellence. In a recent case, a patient attended with advanced periodontal disease and extremely wobbly teeth – despite regular check-ups. To help stabilise the patient she gave up lunchtimes for six weeks to see them, as well as calling them in her own time to make sure they were maintaining the treatment plan at home. Now stable, the patient has a plan in place and sees Mandi regularly. Mandi’s reputation has been built over 20 years as an employed hygienist at mydentist Kandy Lodge. Her diary is maximised through her reputation and drive to promote good oral healthcare in the community. Mandi has an excellent relationship with her patients, who trust her recommendations. This year, Mandi has demonstrated just how committed she is not only to her own patients but those in other mydentist practices. 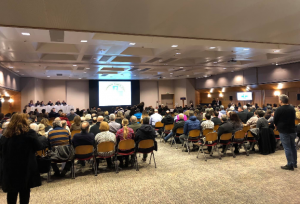 When there was a hygienist off sick at short notice she volunteered to drive to the practice in Anglesey – two hours away – and sleep in her camper van overnight so that she could open the clinic and ensure no patient appointment was cancelled. Mandi is passionate about encouraging children to take up good habits at a young age that will keep them from experiencing dental pain and setting up a lifetime of good oral health. To achieve this she organises Kids Clubs each year in local schools. Using the mydentist kid’s club materials, which include games and puzzles, she delivers engaging events that empower kids to make the right decisions in their diet and teeth cleaning habits. Mandi recently organised a kid’s club event at the practice that coincided with a visit by mydentist chief executive, Tom Riall. The whole practice was involved in hosting 90 children during the event. As expected, the event was a huge success and further events are planned to improve the oral health of the population. Mandi enjoys sharing her knowledge and voluntarily mentors student nurses at mydentist Kandy Lodge in her own time. She provides them with guidance and helps them learn anatomy and hygiene tips that they can pass on to patients. In a recent medical emergency, the practice were able to save a man’s life. According to the practice manager this was all due to Mandi’s regular organisation of emergency scenarios, enabling the team to ‘work like clockwork’. The attending paramedics commented they had never seen a response like it. There has never been a better time to join mydentist, please click here to find out more about our latest job opportunities.